Mix onion, celery, carrot, garlic and seasoning in oil in a large pot over medium heat for 10 minutes, stirring occasionally. Deglaze with sherry and simmer until nearly evaporated, then add chicken broth and bring back to a boil. Reduce heat and simmer 10 minutes. 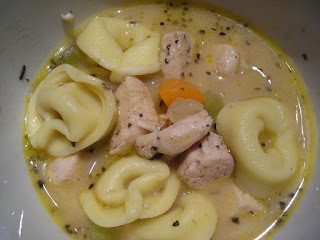 Add tortellini and chicken, and simmer, partially covered, until tortellini is cooked through, 8-10 minutes. Season with salt and pepper.